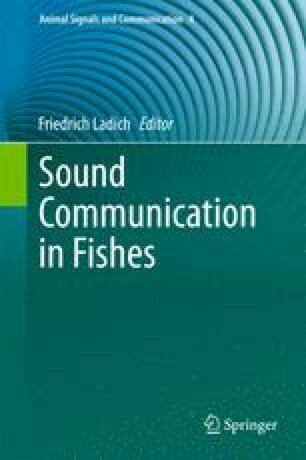 Investigating the potential ability of juvenile fishes to communicate acoustically requires analysing the development of vocalization and hearing . To date, the ontogeny of both processes has been examined in three non-related species, namely the croaking gourami Trichopsis vittata (family Osphronemidae , order Perciformes), the squeaker catfish Synodontis schoutedeni (family Mochokidae , order Siluriformes) and the Lusitanian toadfish Halobatrachus didactylus (family Batrachoididae , order Batrachoidiformes). Juveniles of all three species vocalized during agonistic behaviour and showed similar changes in sound characteristics despite possessing different sonic mechanisms. With growth, dominant frequencies decreased, whereas sound pressure levels, pulse periods and sound duration (except in the toadfish) increased. Generally, hearing sensitivities improved during development, but differences were observed between species. Croaking gouramis of all stages responded to sounds up to 5 kHz. Auditory sensitivity increased in the high frequency range and the best hearing frequency shifted from 2.5 to 1.5 kHz. In the squeaker catfish, hearing abilities increased up to 2 kHz but showed a decrease at 5 and 6 kHz. The Lusitanian toadfish showed the smallest changes of all three species: the best hearing sensitivity was found at 50 Hz in all stages and hearing improved only at some frequencies. A comparison between audiograms and sound spectra within same-sized fish of the respective species revealed that the main energies of sounds were concentrated within the most sensitive frequencies. The comparison also showed that early-stage gouramis and toadfish probably cannot detect conspecific sounds due to low sound levels and high hearing thresholds . Only the catfish is able to communicate acoustically at all stages of development, most likely due to its Weberian apparatus .